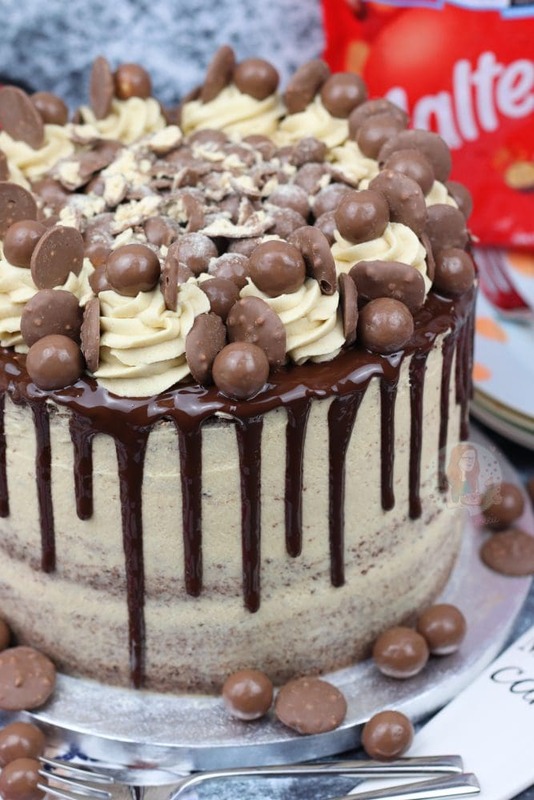 A Three Layer Malt Chocolate Cake with Malt Buttercream Frosting, Malteser Spread, and A Chocolate Drip with oodles of Maltesers! 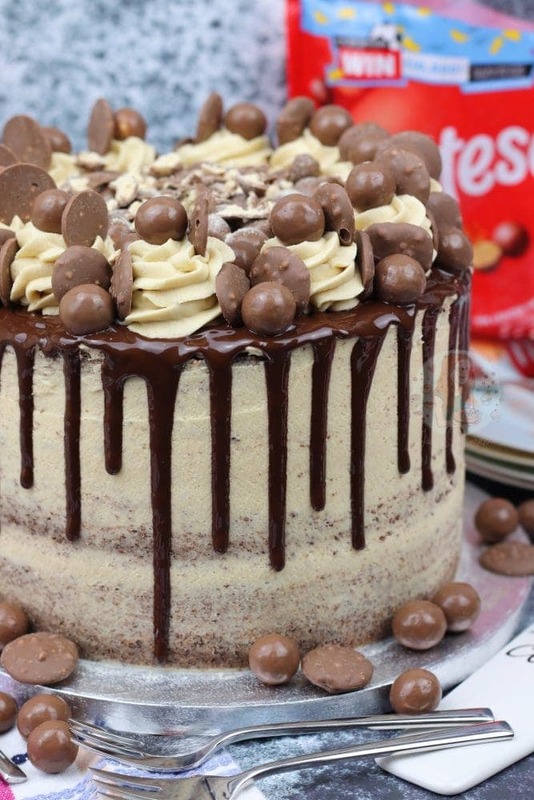 Delicious Malteser Drip Cake! So Malteser Buttons are now a thing, and I finally managed to find them in the shops after way too much time… and now they’re everywhere. I honestly couldn’t find them for so much time, and now they’re in every local supermarket. Including giant sharing bags in Sainsburys! But anyway… I wanted to include them in a bake. I was also craving a massive slice of cake, so a Malteser Cake seemed appropriate. 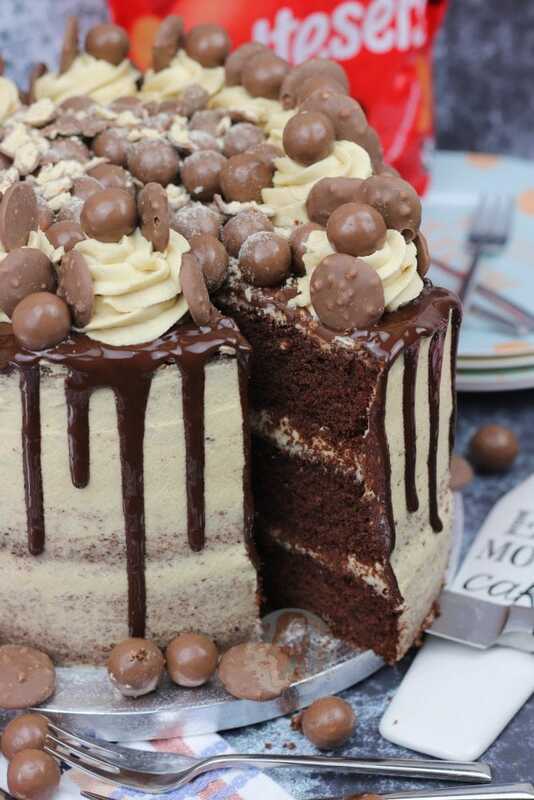 Ages ago I posted my Malteser Cake, and its definitely one of my favourites. The sponges that I use in the Malteser Cake are different to this one for a reason. 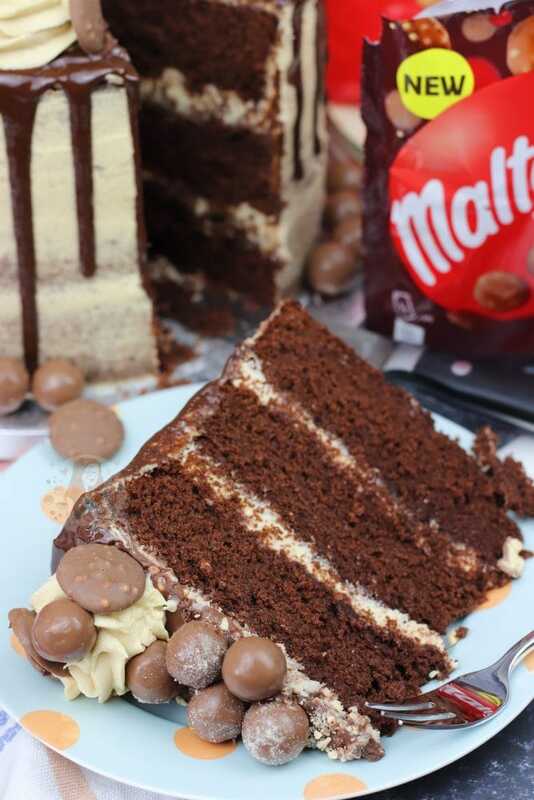 I like posting recipes and such, but I wanted to show a way to make the actual cake part of a Malteser related cake easier for some, as not everyone wants to go through the effort of my other Malteser Cake. I still adore both types of sponges, but this one is definitely an easier one, and probably more stable for a drip cake! One thing I definitely couldn’t change between this recipe, my Malteser Cake, and my Malteser Cupcakes is the Malt Buttercream Frosting. This part does confuse people slightly sometimes, but its a lot easier to make and source than people might think. All it is is a regular buttercream frosting, but with a Horlicks/Ovaltine type drinking powder mixed in. When you’re in the hot chocolate section of the supermarket, you’ll see them. They do quite a few different ones, and sometimes they even sell Malteser Hot chocolate or similar, but the most malteser biscuit type flavour comes from the Horlicks/Ovaltine type powders. This bit is completely optional, you can just use a regular buttercream frosting it you want, but I like to stick with a theme in a bake. For example, in my Honeycomb Crunchie Cake recipes, I use a honey buttercream frosting. For this particular one, I thought I would go for a bit more of semi-naked style cake. Partly because I couldn’t be bothered to do the buttercream in the fully covered way, and partly because I really actually like the look of it! It’s not to everyones taste, but I love it. My Easter Piñata Cake is basically the same, but with the different buttercream flavour. 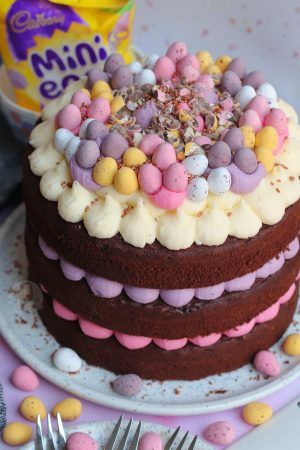 You can easily make this cake into a Malteser version of the Easter Piñata Cake, by following the same methods in the Easter Piñata Cake post, but filling with Maltesers. I didn’t actually have enough Maltesers on the day of baking this as I might have munched on a few too many, but you get the idea. Whichever way you decide to do this cake, it will be delicious. You can see from the slices of the cake that its super chocolatey, and I love that. I use the malt powder in the cake as well to get a hint of the flavour, but you can easily leave it out if you want. I know that Victoria sponge style cakes have 400g of dry ingredients (flour and/or cocoa powder), and technically this one does… apart from the Malt Powder. Adding this in after this makes the cake mix denser, but it makes it more madeira like. If you bake the cakes the day before you decorate, its best to store them at ROOM TEMPERATURE (definitely not the fridge) and they will be super moist and fudgey the next day. Or, even if you decorate on the day of baking, it’ll be lovellyyyyy. I love any type of chocolate cake to be honest, but when the sponge is deliciously chocolatey, then slathered with buttercream frosting, Malteser spread and then even more delicious you can’t beat it. HEAVENLY. 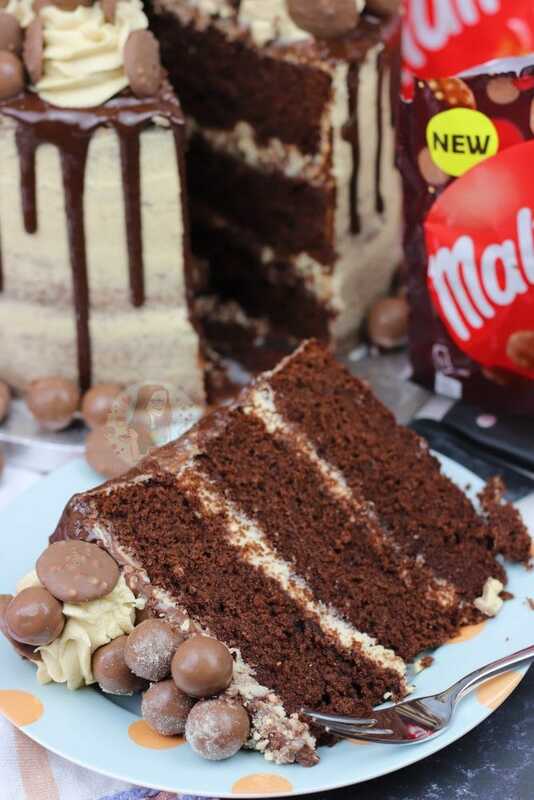 A Three Layer Malt Chocolate Cake with Malt Buttercream Frosting, Malteser Spread, and A Chocolate Drip with oodles of Maltesers! In a stand mixer, beat together the butter and light brown sugar until light and fluffy. Add in the flour, cocoa powder, malt powder and eggs and beat again briefly till combined – try not to over beat the mixture! In a stand mixer, beat the room temperature butter with an electric mixer until it is smooth and loose and then beat in the icing sugar 1/3 at a time until its fully combined. Keep beating the buttercream for a few minutes so it starts to get fluffier and lighter. Add in the Malt Powder and beat again, adding 1tbsp of Boiling Water at a time till you get the buttercream you want. When its hot summer weather, I usually only add 1 tbsp. Once the cakes are cooled, put the first layer on the serving plate - spread one or tablespoons of the buttercream onto the top of the first layer, and spread over a tablespoon of the Malteser Spread. Add the second cake on top, and then top again with some of buttercream and Malteser spread, and then add the final sponge layer. Spread a thin layer or the buttercream around the edges of the cake to fill in any gaps and form a 'Crumb Coat'. Leave this to set in the fridge for 10 minutes, or on the side for 30 minutes until the Buttercream crusts over. I then spread another layer round, but kept it quite thin as I wanted a naked cake style. However, if you want to fully cover the cake, add more on, and scrape it round till its smooth. I use a large metal scraper to do the smoothing. It's easier to roughly spread some around all the edges of the cake, and then smooth it all. Once finished, melt the dark chocolate in a heat proof bowl until melted. Add in 2tsp of oil and beat till smooth. Using disposable piping bags, pipe it round the edge of the cake, edging over slight bits to create the drip. Leave it to set for about 10 minutes, and then add some more malteser spread on top. Alternatively, add the malteser spread on the top first, and then drip around the edges. Leave the chocolate/spread to set for about 10 minutes or so, and then pipe the rest of the buttercream on top, and add on some Maltesers, crushed Maltesers, and Malteser Buttons. This cake will last in an airtight container/cake box for 3 days! 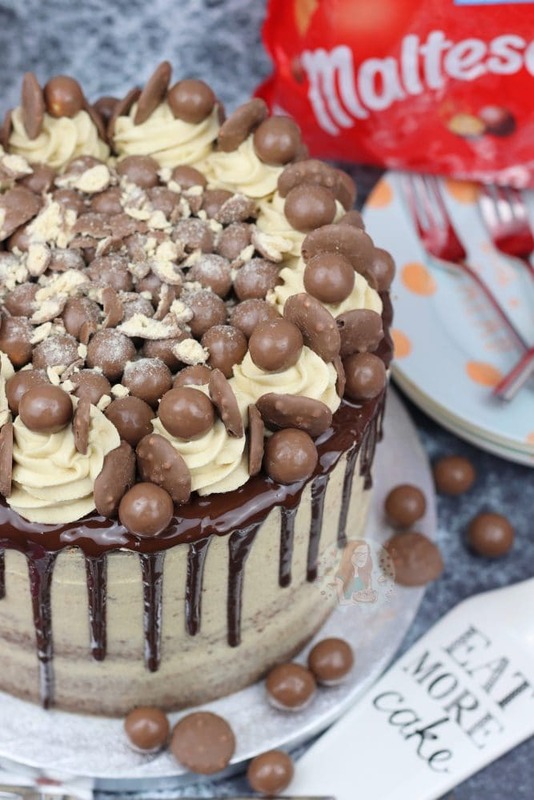 Find my other Cake & Malteser Recipes on my Recipes Page! Older Next post: Raspberry Lemonade! Newer Previous post: Rolo Cookies! No, definitely not! Just use white chocolate on its own. Wow …. made this cake yesterday to take to work today …. amazing ! My first attempt at a drip cake … so easy to follow and it tastes amazing ! About to try this! I can’t find Malteser spread though, is Nutella an alternative and if so do I need to melt it a bit to spread properly? Yeah you can! Just melt for like 10-20 seconds, but not too much… just enough to spread it easier! 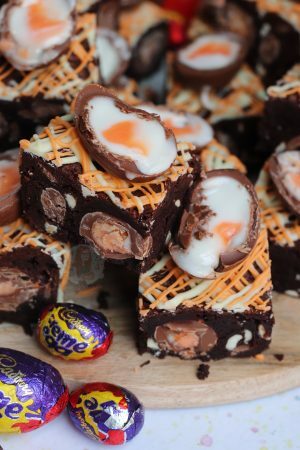 Hi Jane, I would like to make this but only want to make 2 layers instead of three….could you help me with the ingredients? Is it just a case of splitting it into 3 and then x by 2? 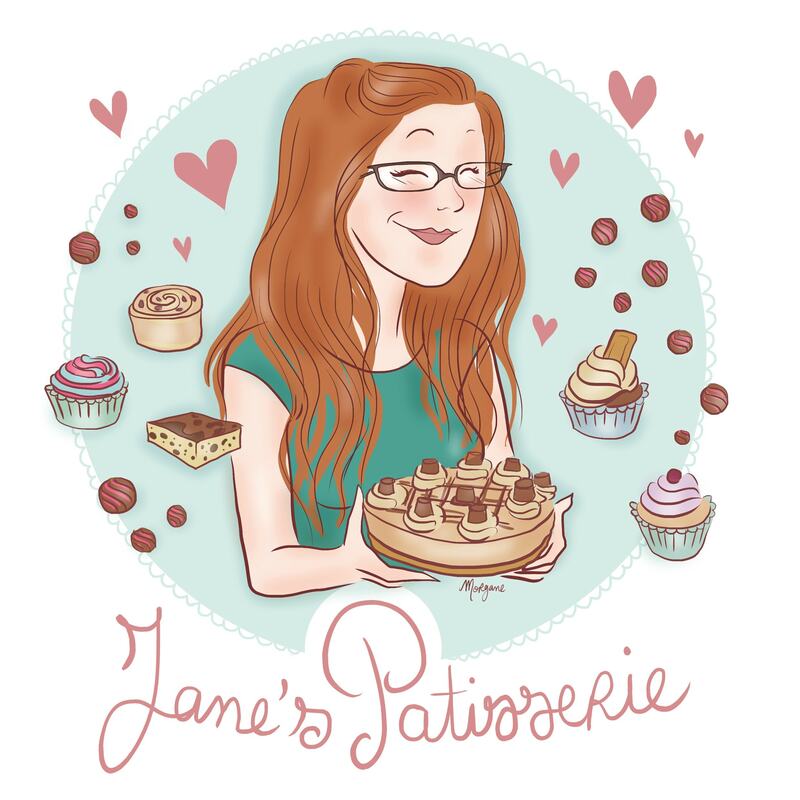 I wouldn’t say so – they tend to bake differently as they’re made up of other stuff. It should really be ovaltine or horlicks! I love your cakes! I’ve made the salted caramel drip cake twice and everyone loves it! I want to make this one with 2x9inch cake tins..do you think that would work okay or would the layers be too thick? 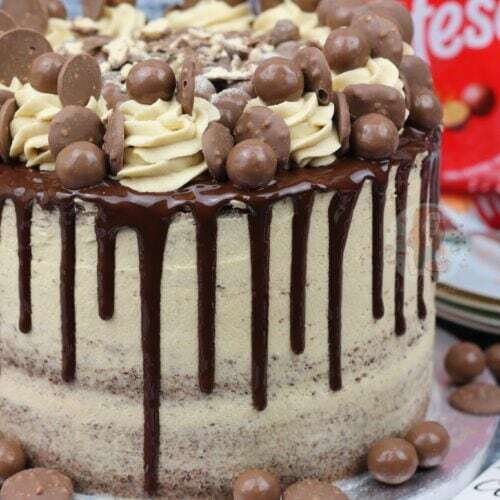 Hi Jane I have made the maltesser drip cake today and I am hoping to decorate it tomorrow ready for my daughters birthday on Monday, where’s the best way to store it once decorated? In the fridge or room temperature? Does it need to be in an airtight container or just covered? 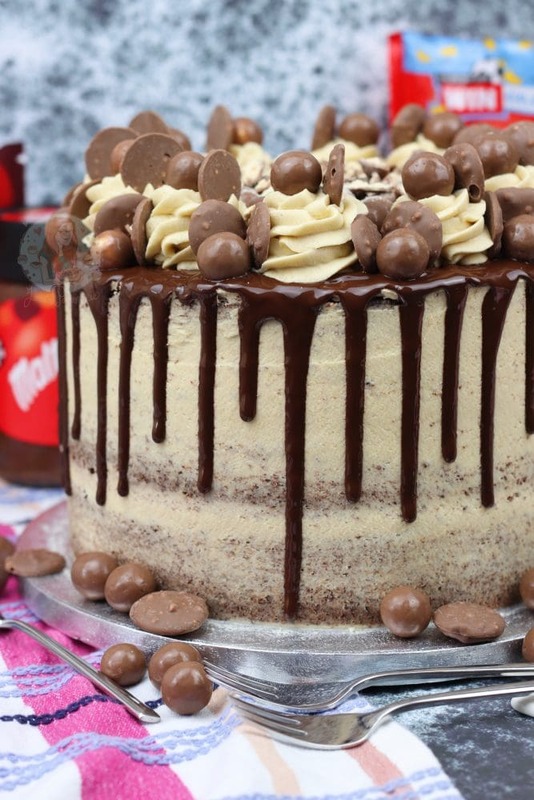 If you’re making the malteser drip cake sponge a few days before you’re serving it, can you freeze the sponge or will its texture be affected? 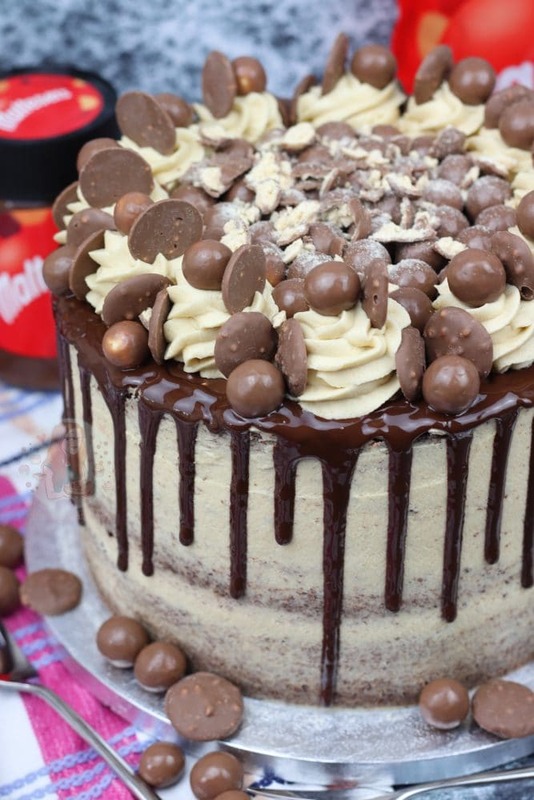 Can the malteser drip cake sponge be frozen if making in advance? Thanks so much Jane, yes probably would be hefty but for some reason I bought the 9 inch pans a while ago & love them, maybe I’ll invest in smaller ones at some point. I’ll let you know when I’ve baked it how it went. Thanks again for the advice! Definitely need to try this. Why do you use oil? Is there any specific one to use? Definitely need to try this out. Why do you use oil in the chocolate drip bit? Any specific oil you would use? Please do! And sunflower oil as stated in the recipe, and because it helps to not let it set rock solid making it easier to cut, and makes it easier to drip. You really don’t need much at all hence the 2tsp for that quantity of chocolate. You can leave the oil out, but the drip will be slightly thicker. 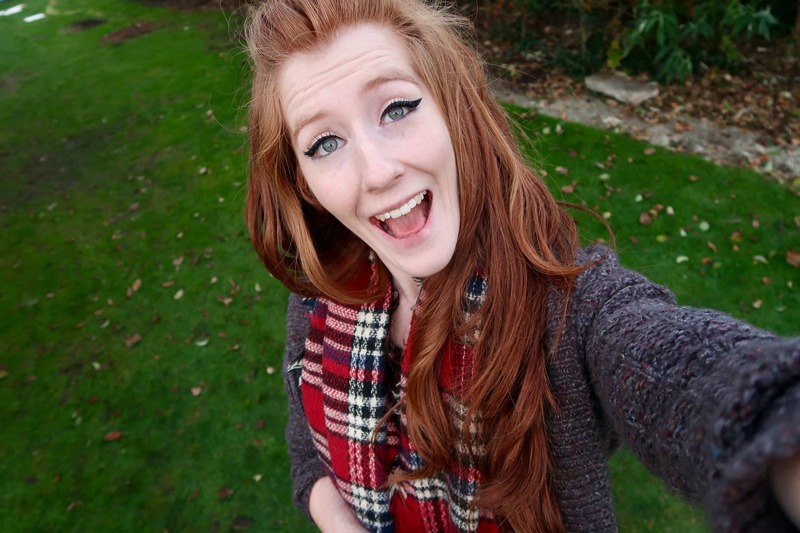 Hiya. My husband is always on about never making him a cake! 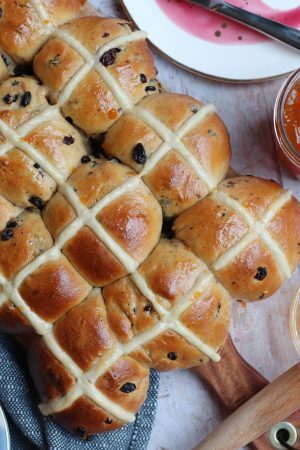 I have a baby so I was wondering if you had any recipes that’s are quick, cheap and easy to do? We don’t like cheesecake so anything other than that! Thank you so much!